A few days in Copenhagen, a city that has quickly risen to gastronomic stardome in the past few years, to participate in a food symposium, seemed like an excellent way to spend my first few days of July. 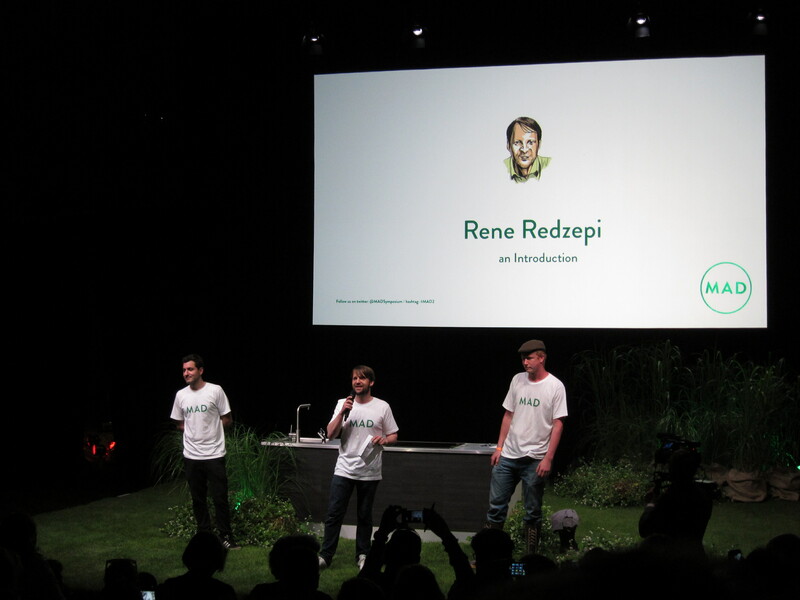 René Redzepi has put Denmark on the map, along with other notable chefs, with their New Nordic style of cuisine. The MAD Food Symposium brings together chefs, food writers, inspirators and purveyors, and it was a collective of people I wanted to hear speak. The first day of the event was great. We all arrived at the orange and red circus tent via a boat (the sun was shining and apparently the weather had been rainy grey up until then) and were greeted with a breakfast of chewy rye bread, slices of pungent cheeses, tart yogurt topped with stewed rhubarb, and most importantly coffee! After traveling and catching up on movies, instead of sleep, my eyes really needed two toothpicks, but caffeine would have to suffice. 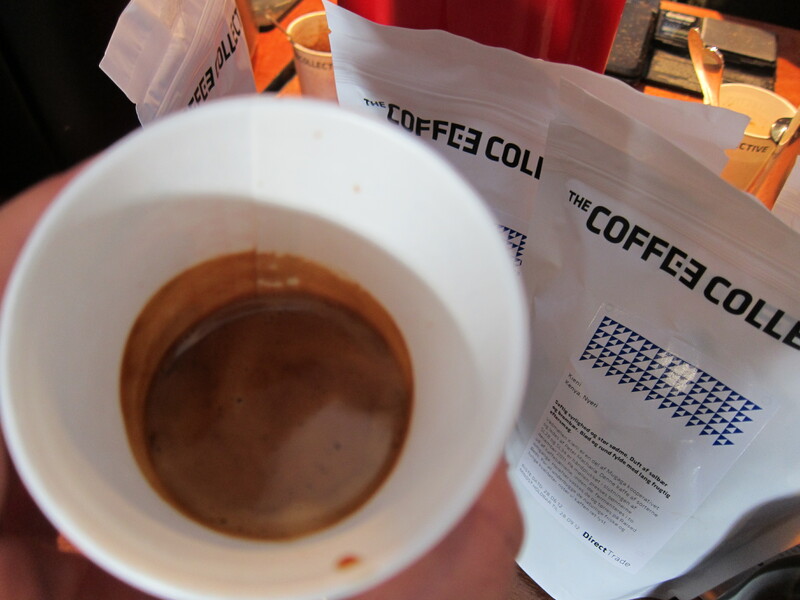 The Coffee Collective, the barristas who supplied the coffee, are magical (http://thecoffeecollective.dk/index.htm). A carefully sourced array of beans along with careful barrista attention to detail made for creamy espressos, flavorful French presses and dreamy cappuccinos. The first day was already off to a great start! The day included many inspiring talkers, along with a few less intriguing ones. But I guess that’s the odds of the game, and it is only the second round of MAD, so kinks are still being worked out. 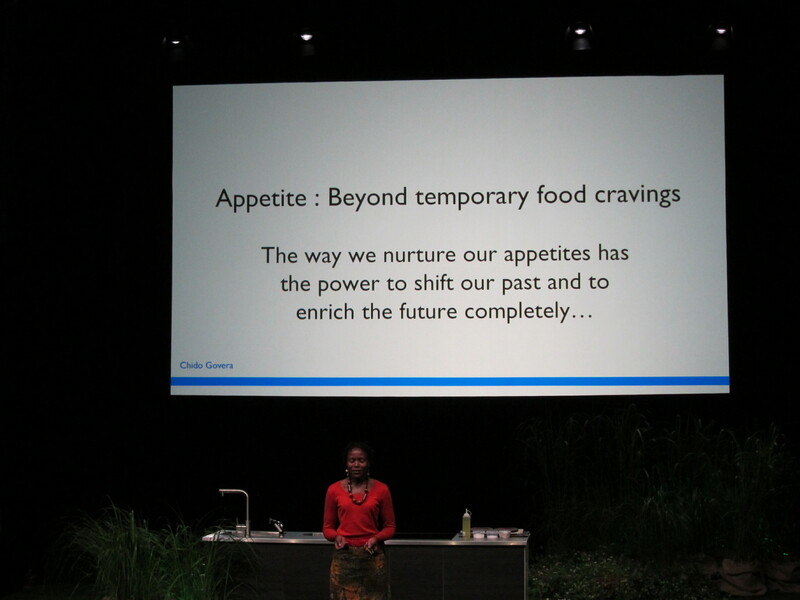 The theme of the symposium was “Appetite” and it was up to the speaker to interpret the topic. Talks ranged from the literal, with Tor Norretranders reminding us that “the world is edible and not the desert we view it as.” We should look beyond the plastic wrapped vegetables in the markets and go beyond. He urges us to “go look!” and venture into the environment for variety in our lives. Foraging is a movement that is on everyone’s lips these days, especially chefs, and Tor reinforces that it’s important to not be so removed from our food sources and “dare to care” for the world, through our appetites. 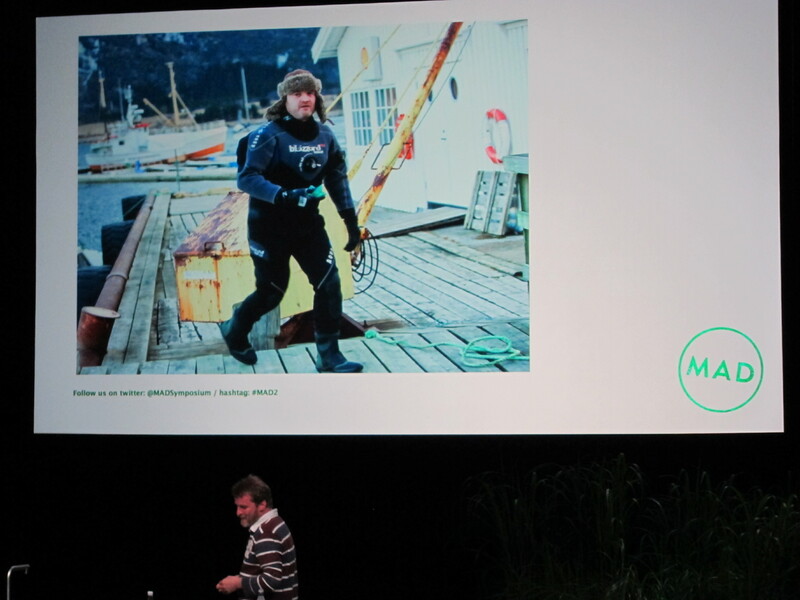 Some of the more entertaining talks came from the sea urchin diver Roderick Sloan, and the Butter Viking, Patrick Johansson. Both men had singular passions, that in truth, seemed a bit narrow. But I find pursuing your dream ballsy, so I beamed when I heard their stories. Sloan navigates rough seas, occasionally getting caught in terrifying storm conditions, to pluck sea urchins from the icy waters. A few years back, Sloan thoguht he’d find himself a safer profession and so enrolled himself in school. However, the water beckoned (and so did Redzepi) and he quickly realized the ocean is where he needed to be. Patrick Johansson also has a micro-focus within the food industry. He produces butter. But his butter isn’t just any butter. 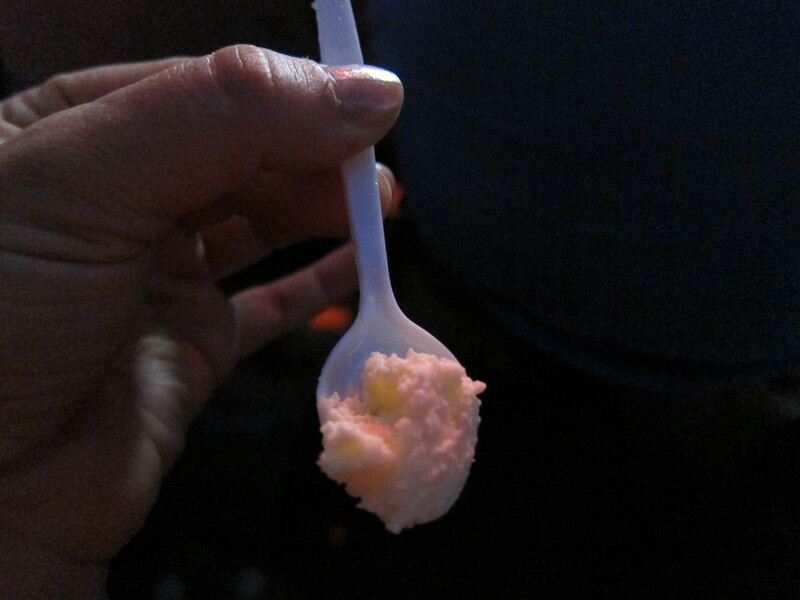 It’s perhaps one of the yummiest butters I’ve ever tasted. The butter is tangy and light, and if you had a pint of it put before you, you would probably eat it like it was a pint of haggen dazs. With butter, we are usually looking for a high fat content. The higher the fat, the better. In America, the minimum is 80%, while in Europe it’s usually at a minimum of 82%. And that 2% makes a noticeable difference. This butter only had 40% fat which made it extremely light, therefore pulling your instincts to treat the butter like a tub of yogurt. Just. Keep. Dipping. The butter is only whipped until the fat solids just stick together, whereas butter can traditionally be whipped for hours, really separating the solids from the liquids. The 82% butters are best for cooking with while this 40% butter is great for simply eating. Johansson is so passionate about making butter that there was a point when he couldn’t even afford to buy the cream to make it. Redzepi loaned the Butter Viking money so he could carry on making his beautiful product. Once and IT man and now a producer of superb butters, Johansson is a lovely example of a man following his golden, buttery path, and sticking to it, even when things get a touch slippery. A few other speakers were less interesting for me personally. 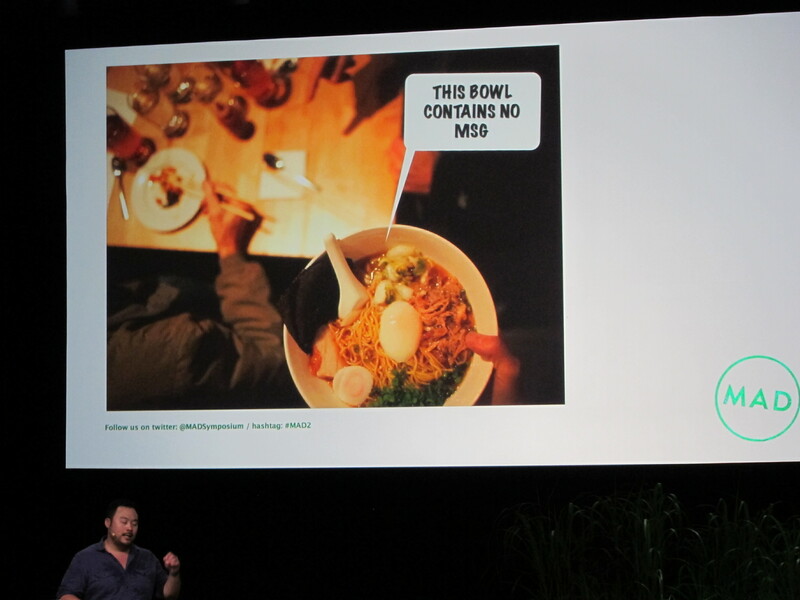 David Chang filled in at a moments notice for Marc Veyrat, a chef many of us were so excited to hear speak. He is considered one of the best chefs in Europe, perhaps even the world, yet he is little known in America. He is both a chef of molecular gastronomy and focuses heavily on gathering ingredients from the wild. I was looking forward to what this chef had to say regarding the theme of ‘appetite’, considering he’s had a long, successful life in the food industry. Chang filled in for him and gave a less than enthralling talk on MSG. He kept reiterating that there is no proof that MSG is harmful to humans and that it occurs naturally in food stuffs: konbu, mushroom, tomatoes etc. Perhaps this talk would have been interesting for elementary children or people who aren’t chefs and food writers, but I felt he was talking to the wrong crowd. This was information that everyone already knew, and his posturing whether we should use the ingredient in our restaurants was a silly one. I’ve worked in 2 four star restaurants that use it. I know many other chefs use it. And whether it’s being harvested naturally, such as making dashi, or sprinkling in a bit of nucleotide into a broth for a richer umami depth, is irrelevant. We are aware, within the food world, that MSG is one of the most abundant naturally occurring non-essential amino acids. It is basically a salt that adds round flavors to food: a flavor enhancer. There was no new information provided nor was it really worthy of discussion. Especially when other chefs on the docket brought up world issues and environmental concerns, such as chef Hugh Fearnley-Whittingstall. Hugh created consumer awareness about fishing practices in Europe. He took a video camera on board a fishery and watched as over half a million tons of fish were discarded as waste because the fish didn’t fit into regulatory categories. The waste was tragic; the ocean could be worth $5 billion more dollars if we treated the animals with respect instead of carelessness. Hugh emphasized the necessity for ethical fishing. Through his campaign “Fish Fight” (http://www.fishfight.net/) he is bringing awareness to over sourced fish and creating uses for the once discarded waste. He was inspiring in his fervent call to end mindless killing. He’s an incredible chef who not only is special within the food world, but an incredible human being who is trying to right the wrong of the fisheries. The most inspiring talk of all came from the single woman who spoke (one female speaker out of twenty-one speakers…) named Chido Govera. Perhaps you don’t know her name; I wasn’t familiar with her work. And one of the first phrases that came out of her mouth was that she was a “poor cook, not very good at all.” I was curious as to how she fit in to the food community. She began her talk in a timid voice, and soon paused while a wave of emotion took away her voice. The memory of her mother’s death, and I imagine her childhood hardships, cracked her strong intentions. She whispered “I hate it when people cry. I thought I was over this…” We watched her regain composure and encouraged her with shouts of love and supportive applause. She took a deep breath and began again. I sat back in my chair and was soon taken on an incredible journey, through both her young life in Africa to her current endeavors today. Govera grew up in Zimbabwe, an orphan by the age of 7 which in turn turned her into the mother of her brother and the caretaker of her grandmother. 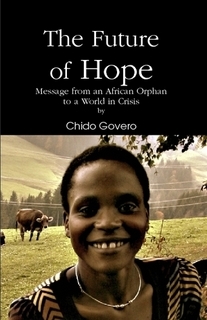 Chido learned about nature and survival from her grandmother, accompanying her into the forrest during the rainy season to collect mushrooms (which the family was dependent upon for food). She learned how to grow mushrooms from agricultural waste and soon was able to not only put her brother through school, but other orphans as well. She was so inspired by the opportunities the mushrooms had provided for her family and the orphans, that she taught herself how to simplify the process and teach it to others. She has taught women and orphans all over the world how to provide for themselves, with hearty mushrooms as a good meat substitute, and most importantly, how to be self sustaining. I sat in the audience wondering why there weren’t more incredible women in the guest list of speakers, and quite simply, why there weren’t more stimulating, invigorating and inspiring speakers. Yes, some of the guests ignited sparks in the room, but many, especially after Chido, left me feeling a bit deflated and more than a bit like egoists. The aim of the symposium is to inspire, feed each other ideas and light fires under us so we too will go out and change things. 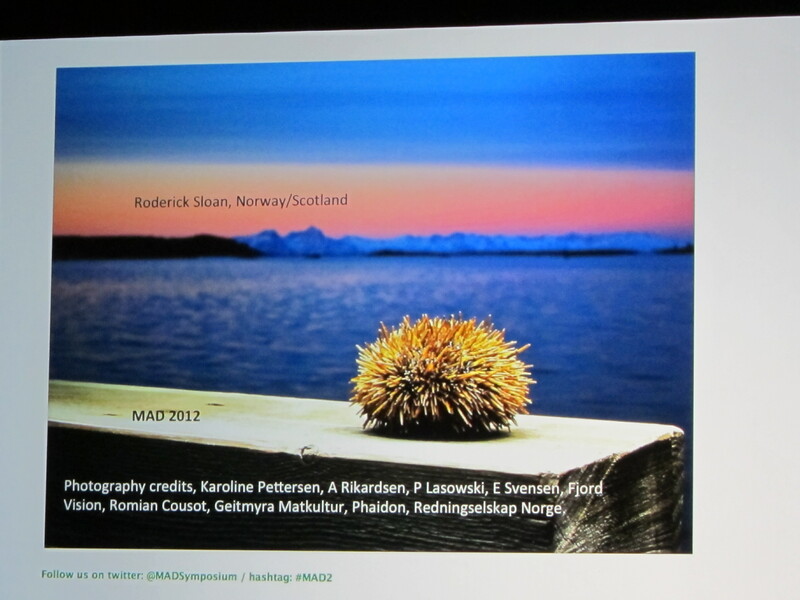 MAD’s theme encourages us: “We need appetite to dare for bigger, to think bigger.” Some speakers truly left me with a feeling of awe and inspiration, whereas others seemed to miss the point. 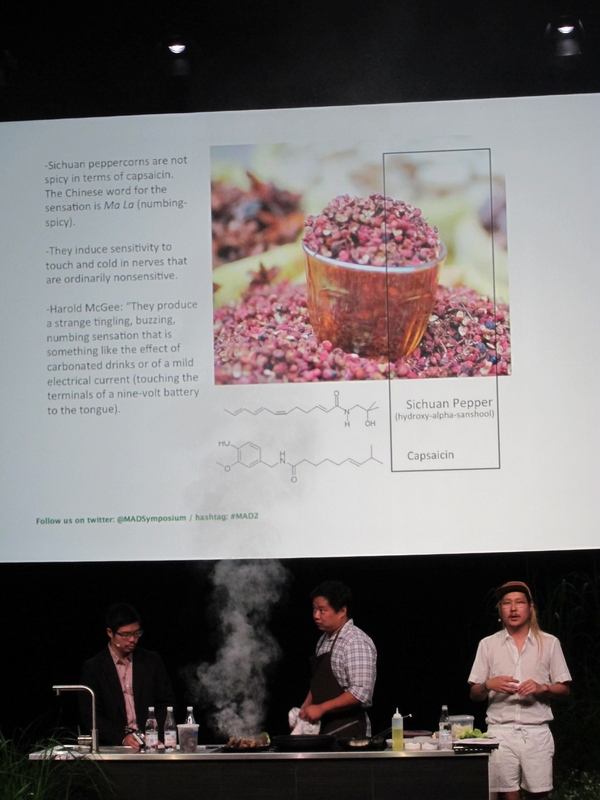 The boys from Mission Chinese gave a fun recap of how they’ve attained success with restaurants. We learned of their rough beginnings, in a once-weekly rented Chinese restaurant in the Mission district of San Francisco. The chefs were allowed to cook on Thursdays under the condition that the original Chinese restaurant could still do take-away orders. I smile when I think of their first endeavors, plating fancy foods and paying homages to great chefs, while spring rolls were being fried off amidst plating. The white clad Danny Bowien and his partner Anthony Myint, a hilariously monotone soul, donate money from every large dish to Food Banks in California and New York. Charity is a huge part of their mission, if you will. I’ve been to their restaurant in the Lower East Side and find the food tasty and the atmosphere fun. These two young men are inspiring in the sense that they make me realize that it’s doable to open a business in New York and to still give to charity. A+. 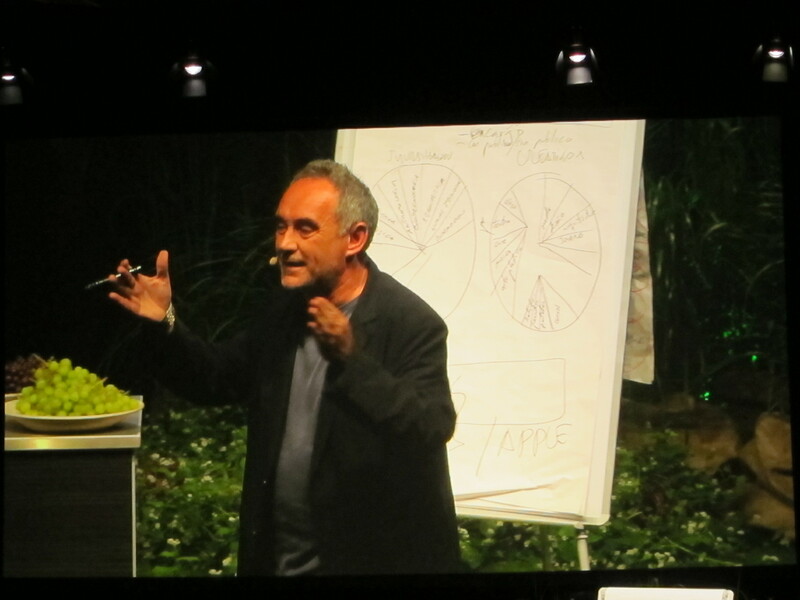 Out of the many speakers, I’m only highlighting the ones I wanted to reflect on, and of course Ferran Adria has to be one of them. I’ve seen him speak several times now and this event was no different, except for the fact that he no longer has the world famous restaurant associated with his name. He didn’t even really speak about his plans for the school he is building in its place. Instead Adria discussed how “we must value what came before us, otherwise we have nothing.” He went on to speak about the responsibilities of chefs, and how the desire to create, creativity in and of itself, is the most difficult thing to do. Creativity won’t love you back, it has no compassion for you. You must have the passion for it and wake up and pursue it every single day. He insisted that to move forward, we must maintain consciousness for the past. Ferran is so vivacious and bounces around on stage, making it ever so evident how this man could sustain the momentum that he did for the past 30 years. The symposium was filled with guests from around the world, eager to hear the thoughts and ideas of some of the game changers within the food industry, and be part of a collective that aims to change the world, either through great forces of strength that teach children how to care for themselves, or pioneering chefs who are looking for better products (Dan Barber finding inspiration in new wheat varieties), or young chefs who donate money back to the community. MAD Foodcamp (MAD in Danish means food) has high-minded intentions and I look forward to the years to come where more female speakers will represent and every attendee will leave with the desire to go out and change the world for the better.